Hair is a vital part of the human body. Hair is a protein filament that grows from the skin. It is a characteristic of mammals. Hair grows on all parts of the body of humans except the palm and feet. It is called differently depending on the place it grows. Facial hair growth in men are the result of secondary sexual characters and that marks the difference between women and men externally. Hair grows longer on the heads than the other parts of the body. So they are either cut or trimmed to make one look presentable. On an average people have more concern for hair and always look to groom it. The hair color varies from person to person. Hair provides people with social status based on their religion, equality status and social status. In order to grow well, hair generally falls down. On an average people lose about 100 strands everyday. The lost hairs are replaced by new hairs. The problems occurs when the replacement of new hair takes some time or stops replacing. At any given instant of time the hair grows and the rate of its growth is one inch a month. Hair fall affects all human beings on the earth and it has not left anyone untouched. It is one of the most serious and major health issue in the world. People spend lakhs of money to get relieved from this problem. But the common sense is once the hair falls there is no way reversing it yet we can stop further shedding of hair. When in the morning, If we get up to find some hair strands on the bed and pillows, then it is a sure sign of hair fall. This makes some feel remorse and desperate. It makes some lose confidence and affect their that part of the day. More strands of hair on combs or towels after we wipe our hair. This results when one roughly pushes the hair aside. Rough handling of hair also results in hair loss. Hair fall is predominant in males. Male pattern baldness like receding of hair from the forehead or from the top of the head. This is usual in males due to the secretion of a certain enzyme. Even in women, hair fall is inevitable but it can be seen in small portion. Their hair thins and the parting can be seen. But some women go completely bald. Sudden or unpredictable hair fall may be the indication of any underlying complications of the body and should not be ignored. Hair fall may be the result of one or more of these above reasons. In some people the hair fall problems are permanent while in some it is temporary. 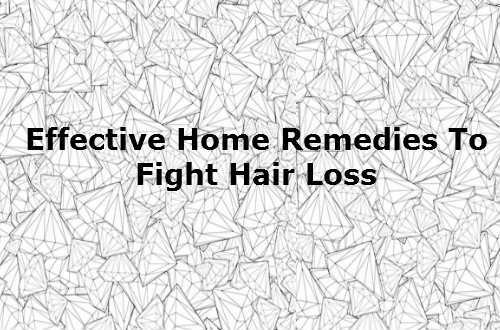 Whatever it may be it is better to prevent hair loss using the medications. Coconut oil and milk nourishes the hair follicles and results in hair growth. Scrape the coconut from the shells and blend it using a blender until it becomes a paste. Then squeeze it to get the milk and apply on it on the scalp and leave it on for about 15 to 20 minutes and massage well. We must try doing it once a week. Similarly applying coconut oil on the head produces similar effects. We must add fresh Neem leaves in a water and boil it. After that we must allow it to cool. We must wash our face and scalp with it. This prevents hair fall in both men and women. We must add two tablespoons of olive oil and honey each and mix it well with cinnamon until it becomes a fine paste. We must apply the paste on the scalp and let it to remain so for about half an hour. Doing it once a week will prevent hair related problems. Amla can be mixed with either coconut oil or the mixture of aloe vera and neem. In either case we must apply the paste on our head and leave it as such for about half an hour. We must then rinse our hair afterwards. This prevents the hair problems. We must mix fresh curd with two whites of egg and with add shikakai paste or neem powder supplements. After applying them on our head we must leave them untouched for about half an hour. This prevents breaking of hair and split ends. Any oil like coconut oil, Neem oil, jojoba oil and mustard oil is healthy for the hair. Massaging hair everyday with lukewarm oil increases the circulation of the blood to the follicles. We should slice the onion into two pieces and massage the onion on the scalp of our head for some time. Then we must apply honey in the same way on our head. This stops hair loss. We must ground lime seeds with black pepper and apply it on our head. This helps to heal sore spots on the heads. Similarly shana seeds are moulded in castor oil or coconut oil and applied on the head to get a lustrous hair. We must avoid eating certain foods and instead eat a very healthy balanced diet. Certain foods increase the toxins in the body. These toxins can be flushed out from the body by drinking more water. A balanced diet will supply the body with essential nutrients like iron, vitamin and other nutrients. Instead of all these above different medications properly maintaining our hair is important. Regular washing of hair enhances the hair growth. We must also refrain from using hair dryers that seriously affect the scalp. We must apply our hair constantly with tea decoction, lime juice and tobacco sauce.